Do you believe in mysterious creatures? Or maybe you are an eyewitness of something like El Chupacabra is? This name means "the goat sucker" in Spanish. The reason for this name derives from the fact that the victims of this creature were usually goats who died with two puncture wounds to the throat and all of the blood was removed from their bodies. At first it was spotted in Puerto Rico in 1994, where distressed farm owners began finding their livestock in this rather garish state, since it migrated off the island and has recently been spotted in many locations including South America as well as the US. The occurrences began shortly after hurricane Hugo, and led any to believe that secret genetic testing had been being conducted by the US military, and that a facility deep in the rain forest had been destroyed or damaged, and these genetically altered animals escaped. Soon after, the sightings of the creatures began to spread, first from Central America, then to South America, Mexico and to the United States. Like other creatures in the crypto zoologist’s barnyard, the chupacabra has been variously described. 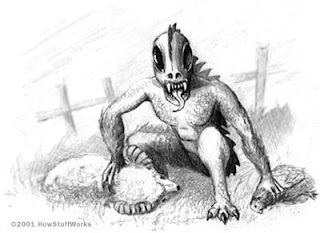 Some witnesses have seen a small half-alien, half-dinosaur tailless vampire with quills running down its back; others think that they have seen a panther like creature with a long snake-like tongue; still others have seen a hopping animal that leaves a trail of sulfuric stench. Some think it may be a type of dinosaur. Some are convinced that the wounds on animals whose deaths have been attributed to the chupacabra indicate an alien presence. Such creatures are known as Anomalous Biological Entities in UFO circles. There have been, of course reports of attacks on other types of animals, as well as attacks on small children. There are other theories popular on the internet about these creatures, that they are "pets" of extra-terrestrial beings etc... Although some people say, that they have seen the Chupacabra's tracks, in many cases there are no signs of blood or tracks around the dead animals. The El Chupacabra although seen by many has never been photograph and to this day we have nothing but the eyewitness accounts and artist renderings.